Spectacular views from this modern beach house with all amenities. This is set up as a home away from home, with stunning harbour and sea views from every room. We'd describe this beach house as comfortable - not flashy. It's located high up on the ridge with an expansive sea vista out to the Barrier Islands and Pakiri beach, with the Coromandel in the far distance. The local beaches are just minutes away and easily within walking distance. Set well above the road, this very private property offers total peace and quiet, with a feeling of being "King of the Castle". You can look down on everyone else, but nobody can look in on you ! Surrounded by native bush on three sides, the panaromic view directly in front is simply stunning ! Outdoor furniture for eight on the huge decks makes for a great indoor/outdoor flow, and the 200 degree views out over the bay will likely keep you in one of the deck chairs for hours. In the summer, we have a gas BBQ available to guests to use at their leisure. Winter time brings a cosy log fire and games inside. 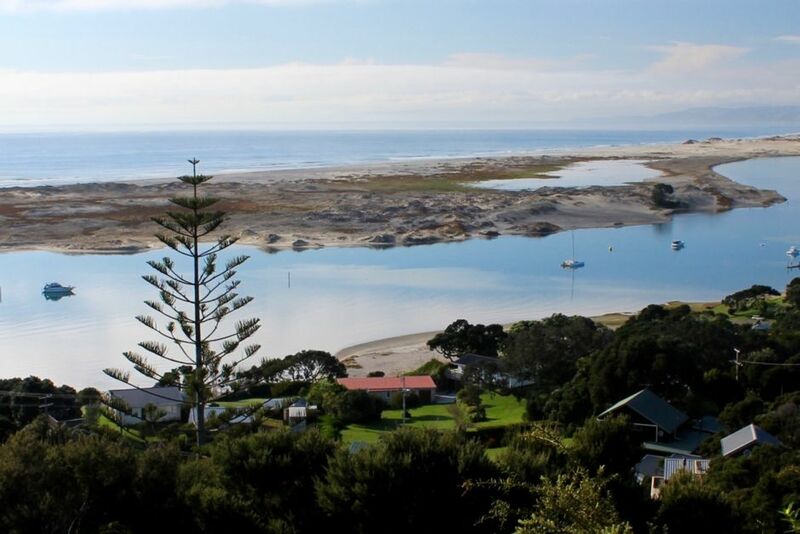 Our on-line guest book confirms this is an absolute dream holiday home, and one of the very best beach houses in New Zealand. As bach owners for more than a decade, we endeavour to make your booking process easy, and we pride ourselves on the high level of detail in all communications. This is one of the most popular baches in the country, and there's a reason for that - word of mouth and Book-a-Bach are the only advertising media we've ever needed. The level of repeat guests continues to astound us, and we genuinely enjoy sharing this piece of paradise with others from around the world. Come and experience this truly awesome property, and you'll find it's addictive. Don't be surprised if you find yourself coming back again and again ! Easter weekend 2018 will require a minimum 4 night booking from Thursday, 29 March to Monday 2 April. Two night stay minimum otherwise. Larger groups andgt;5 by negotiation [generally add $50 per night]. Completely relaxing with commanding views from every vantage point ! toilet, Small ensuite toilet off master bedroom. Off street private parking for at least 4 cars. Relaxed lounge area seating 5 on a comfortable couch, with an additional 2 variable height kitchen stools. Glass top table seats 5-6 adequately and adjoins the lounge in an open plan. A wide range of books and magazines available for guests to read. Plenty of lawn on both sides of the house for kids to play or sunbathe. Absolutely huge decks abound on the seaward side, providing guests with 180 degree views out over the entire bay. This is arguably the best view of any property in Mangawhai Heads. A rustic style beach house - very comfortable but not flashy. Only 75 minutes north of the Harbour bridge, and yet you'll feel like you're in a remote paradise !